Viking Books for Young Readers, 9780670014026, 40pp. Everybody knows your typical dragon breathes fire. Crispin wonders if he’ll ever find his inner fire. But when a family emergency breaks out, it takes a little dragon with not-so-typical abilities to save the day. 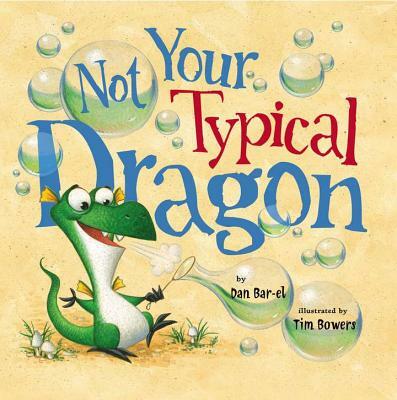 With wry humor and whimsical illustrations, Not Your Typical Dragon is the perfect story for any child who can't help feeling a little bit different. Dan Bar-el is an award-winning children's author, educator and storyteller. His writing includes both chapter books and picture books, all of which are highly flammable. If you are reading this book with a dragon, he asks you to please use caution. When not writing or putting out fires, Dan travels about, visiting many schools and libraries. He lives in Vancouver, BC with his wife, artist and goldsmith, Dominique Bréchault (who happens to own a blowtorch!). Tim Bowers has illustrated over thirty books, including the New York Times best seller, Dream Big, Little Pig by Kristi Yamaguchi. His books have received numerous state and national awards and have been chosen as Junior Library Guild selections. His artwork has been exhibited in the Society of Illustrators Annual Art Exhibition in New York and Los Angeles and the prestigious Original Art Exhibition, celebrating the fine art of children's book illustration. Although Mr. Bowers was born into a proud family of hairdressers (his mother was a hairdresser, his grandmother was a hairdresser and his great-grandfather was a barber) he opted to become an illustrator. Now, without hair, Bowers continues to enjoy telling stories with pictures, which is not your typical Bowers.